The original is in Tamil – a very brief beautiful short story written in an innovative style by Mullaithivyan, a youngster from Mullaitivu. It is professionally translated into Sinhala by Ananda Ruhunuhewa, into English by Gerard Robuchon and Patricia Melander and into French again by Gerard Robuchon. The translations have different titles as understood by the respective perception of the translators. For instance, the writer in Tamil calls his story-Thai (Mother) Nilam (Land). 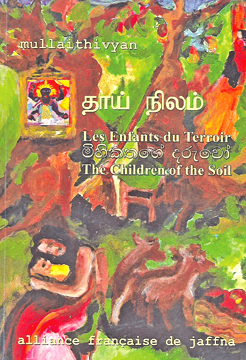 And the Sinhala title is Mihikathage Daruwo and the French translators connect it as Les Enfanrts du Terroir. The Tamil community, particularly those in the North of Lanka should thank Dr Gerard Robuchon for promoting young writers in the North to develop an aesthetic engagement in literature, films and the fine arts and of course promoting French Culture among the people in the peninsula. Before I come to the short story I have some other information. One is artists from Maddakkalappu (Batticaloa), Thirukonamalai (Trincomalee) from the east and Mahanuwara (Kandy) in the central hills. The colour paintings are by Patricia Melander who has lived in U K, France, Yaalpaanam and Matara. The second important aspect of this 76-page book is three distinguished writers who are known internationally have written an afterword to this book. They are indomitable poet and writer- Jean Arasanayagam, a fearless creative writer, Manuka Wijesinghe and the director of Yaalpaanam Alliance Françoise, Gerard Robuchon. “Mullathivyan is a writer, a real writer because he has style. And I like his style very much- efficient, and making the writing beautiful and powerful. A message is none without a style in literature.” More (Gerard Robuchon). I like the last point very much. So this is a collective work. Here are some passages I selected for your reading pleasure. I take the passages from the English translation. I walk through the tracks of red soil while a cool breeze from the North caresses my body. Here, the most prominent among all the trees are the jackfruit tree. The place is called ‘Thanni Urru’ at Mulliyavalai and this means ‘good water’. Mulliyavalai is the beautiful village where Yarlmoli lives. He continues with the description of the surroundings towards Yarlmoli’s house. The narrator of this passage is another woman whose name is Maanvili. Oh, you must read to know what had been their lives tortured by both the warring stupid elements, who lost the sense of love for the humankind.